Everybody wants more leads, and rightfully so. Leads (done right) beget sales. Sales beget revenue. Revenue leads to profits (usually). And profits mean everyone keeps their jobs. But lead gen, in B2B in particular, inevitably requires data. That data lives in the database, which is, in large measure, the brain of all lead gen initiatives. 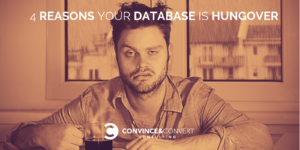 B2B marketers spend a ton of time thinking about how to GET MORE LEADS, so they can put more information in the database. But they spend far, far, far less time (too little, in reality) thinking about the actual quality of that data. The problem is that the database brain isn’t as sharp as you think it is. Like trying to do a crossword puzzle after a night of drinking double IPAs, you’ll view most databases as being a little fuzzy and foggy. This is not because your database is addicted to hops, although your results may vary. Instead, your database operates at less than peak efficiency (imperiling your lead gen) because the information stored in it often doesn’t match the real-world reality it is intended to mirror. You can get it at no cost right here. Is it any wonder that we can’t even get holiday cards sent out accurately, much less crush lead gen goals? According to Forrester, 84% of organizations say the accuracy of data is one of their top marketing weaknesses. Yep, that sounds about right. How do you improve your database hygiene so incorrect or outdated information isn’t leading you astray? Make sure the data is captured right the first time and some smart aleck isn’t putting test@test.com in your form. Routinely test, verify and validate all of the information you’ve already collected and make changes where necessary. Take your now squeaky-clean data and bridge it to CRM and marketing automation platforms, so your sales team can close more deals, more quickly. Bank on Data Quality in Your 2019 Budget includes four interesting case studies on these key points, including real-world tales from BrainShark, netFactor, Oracle/Eloqua and Concur, all of which gave their databases the ZoomInfo equivalent of a next-day hot shower, cup of coffee and ham and cheese omelet. One of the most common problems caused by outdated and incorrect information in the database is email bounce rates. At one point, netFactor was seeing bounce rates as high as 50% for some of their lists (!!!). After plugging in with ZoomInfo, that dropped to 3.5%. Sobered up! If you’re in B2B and care about data quality (please do) take 1.35 minutes and download Bank on Data Quality in Your 2019 Budget, please. And thanks to ZoomInfo for fighting the good fight on data quality. It’s an important and under-discussed issue.